Vegetable garden planting strategies like interplanting, succession planting, trap cropping, companion planting, and vegetable crop rotation are all organic gardening methods designed to give you the highest yields over time, without chemicals. All involve garden spacing, the mix of plants, and the timing of planting. Some, like interplanting, increase yields by adding a second crop that matures before the main crop, so you grow two crops in the same space. 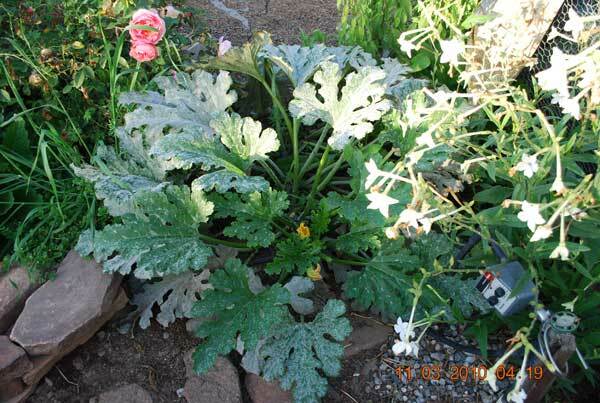 Others work by reducing losses to garden pests, or enhancing the flavors of vegetables around them. 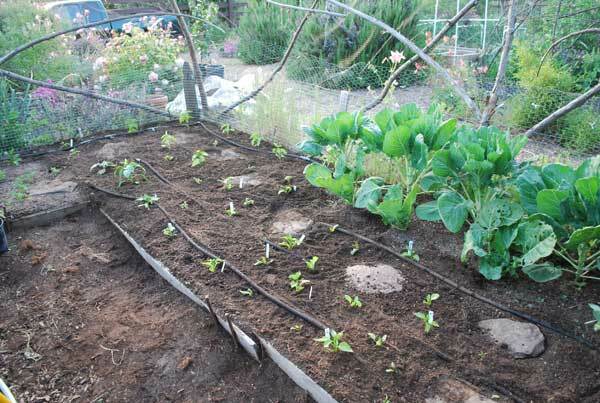 Correct vegetable garden planting means getting the spacing between plants right at the outset. 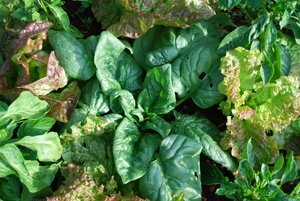 If you get garden spacing right, you’ll have higher yields, and save yourself a crash course in pest and disease management later in the season. You have to imagine the vegetables as they’ll be when fully mature, and plant them on that spacing. In most cases, the recommended row and plant spacing on the seed package or plant tag from the nursery will produce maximum yields in conventional row gardening, where the soil is rototilled or prepared to 1 shovel depth, or 9-10” (23-25 cm). These numbers have been worked out through field trials and countless plantings, in home gardens as well as large farms. Gardeners ignore them at their own peril. If you plant seeds, thin them to the recommended spacing a couple weeks after they come up. In a deep-dug or raised bed vegetable garden, the beds are twice as deep—18-24” (46-61 cm)—and are arranged with paths all around them, so you never walk on the bed to access the plants. This avoids compacting the soil, so the plants stay healthy even on tighter garden spacing. There’s no need for rows between plants, because you access the plants from the side, not the middle. 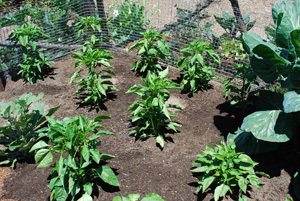 In a raised garden bed, plants are set out so their leaves touch when the plants are mature. 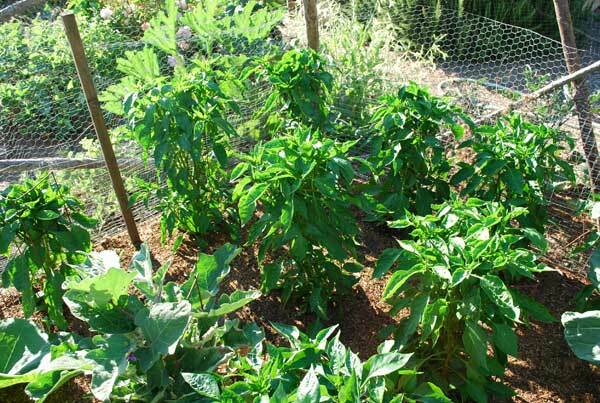 The foliage of the vegetables forms a canopy that protects the soil from the drying effects of sun and wind, holds in moisture, and prevents sunscald. You’ll often hear about “hexagonal spacing” when people talk about vegetable garden planting in a raised bed. When someone says “plant on 8” (20 cm) centers”, this means the plants are the same distance apart in all directions. In practice, this means staggering every other row, back and forth, until you run out of bed. Instead of a grid of plants lined up with each other in rows (top image), each subsequent row is shifted slightly, so the plants are set between plants in the first row (bottom image). Hexagonal spacing allows you to fit more plants into a given space. In the image above, the hexagonal spacing bed is narrower, but has the same number of plants as the wider row spacing bed. Vegetable garden planting in raised beds allows you to tighten the spacing between plants for summer vegetables like tomatoes, peppers, chiles, and eggplants. There are some vegetable garden planting situations where it’s appropriate to increase or reduce the recommended spacing between plants. You may want to increase spacing between plants in cool, damp climates or shady gardens that get less than 6-8 hours of sun, or wherever foliar diseases like powdery mildew are prevalent. Opening up plant spacing improves air circulation and allows better sun penetration, making life harder for pathogens. You may want to tighten spacing between plants in sunny exposures or hot, dry climates. If you tighten spacing, the closed canopy of vegetable foliage shades and cools the soil, holds in moisture, and reduces sunscald. 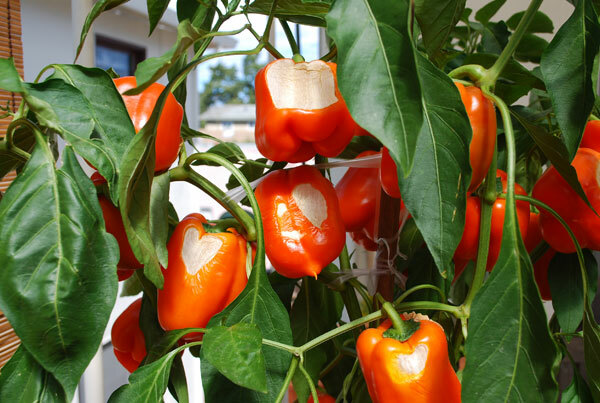 Sunscald is scarring of tomatoes, peppers, eggplants, and squash that can occur on the sunniest, hottest side of the plant. Interplanting, also called intercropping, is a vegetable garden planting strategy that gives you multiple crops from the same garden space. A short-season vegetable like lettuce, spinach, pak choi, or tatsoi is interplanted between main-crop vegetables like peppers or tomatoes that produce later in the season. 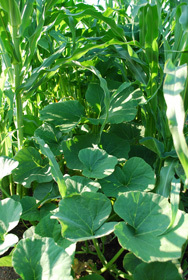 The main-crop plants are planted on the garden spacing they’ll need at maturity. Peppers or bush tomatoes need 15-18” (38-46 cm). In the spaces between, you plant short-season vegetables that tap a different part of the soil, and are harvested before they start competing with the main-crop plants. 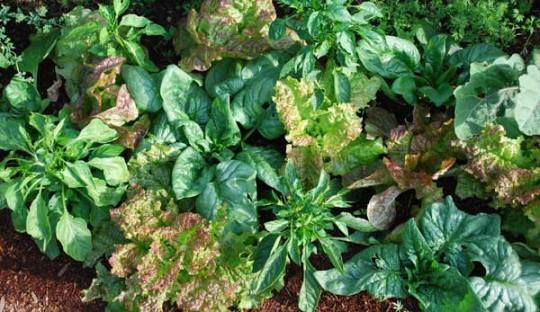 Lettuce and spinach, for example, are excellent interplants for tomatoes, peppers, and eggplants. At the beginning of the season, the main-crop plants focus on extending their root systems deep into the soil, while the short-season plants exploit the top 6” (15cm) of soil to fuel rapid leaf growth. break up the visual and chemical signatures of the main-crop plants, making it more difficult for garden pests that eat them to find a meal. By the time the leafy greens are ready to harvest, the main crop plants are big enough to fill out and take over the bed. Of course, this all depends on harvesting the leafy greens when they’re ready. If you wait too long, they start to bolt, or send up a flower stalk, and then they start tapping deeper roots and start competing in earnest with main-crop plants, reducing their yield. In the vegetable garden planting photos below, the interplanted lettuce and spinach has been harvested in the first photo. 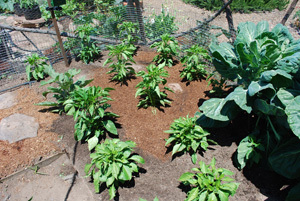 A layer of mulch is applied in the second, and the third shows the chile plants 1 month later. 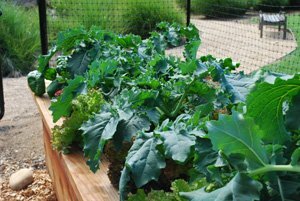 Succession Planting is a vegetable garden planting strategy that guarantees a steady supply of short-season vegetables you use frequently. Lettuce, spinach, arugula, Asian greens, basil, cilantro, green onions, radishes, beets, and carrots are vegetables that mature in 6-12 weeks, so you’ll need multiple plantings to have a steady supply through the growing season. With these vegetables, it’s best to sow small patches every 2-3 weeks, instead of planting one big patch at the beginning of the season. Thomas Jefferson planted a teaspoon of lettuce seeds every week at Monticello. If you want a steady supply of lettuce from your garden, follow the example of one of our Founding Fathers—but use 1/8 teaspoon of seeds, and plant every 2 weeks instead of every week. 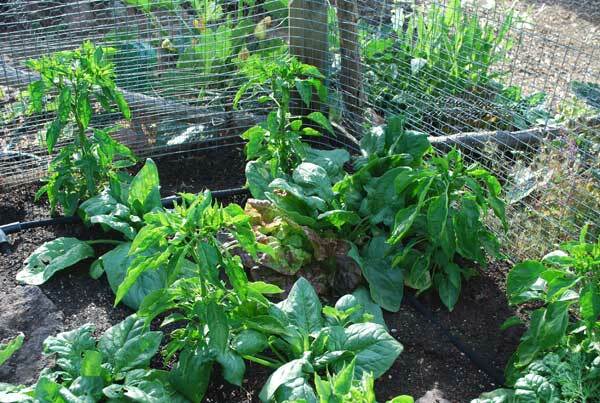 Trap Cropping is a vegetable garden planting strategy that involves planting something garden pests like better than the crop you’re growing, then uprooting and removing the trap crop once the pests have infested it. In the process, you knock back the breeding population of the pest. Nasturtiums are a great trap crop for aphids. 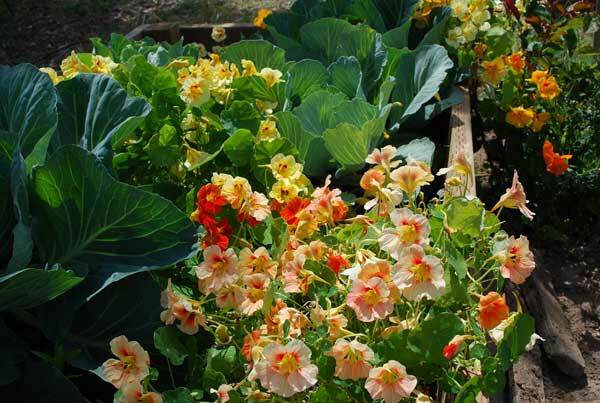 In the photo, nasturtiums are planted near cabbages, to draw the aphids away. You can either put the trap crop plants into a plastic bag in the sun for a few hours, or bury them in the middle of a hot compost pile to dispense with the pests. Try not to take too much pleasure in it. Tip: don’t remove all of the trap crop. If you leave one or two pest-infested plants—the ones farthest away from your crop—you can boost populations of beneficial insects that control pests by providing them with a food source. See natural garden pest control for more information. Companion Planting is a vegetable garden planting practice of pairing plants to enhance their growth, improve their flavor, or deter garden pests. There are numerous books and web sites devoted to companion planting, so I’ll just cover the basic principles here. The classic example of companion planting is the “Three Sisters” Corn-Bean-Squash Polyculture of Mesoamerica, the foundation of the Mayan and Aztec civilizations. The corn grows tall, providing a natural trellis for the beans to climb. It also pulls nitrogen out of the soil, forcing the rhizobia bacteria on the bean roots to fix more nitrogen from the atmosphere. The squash forms a low, dense canopy underneath. 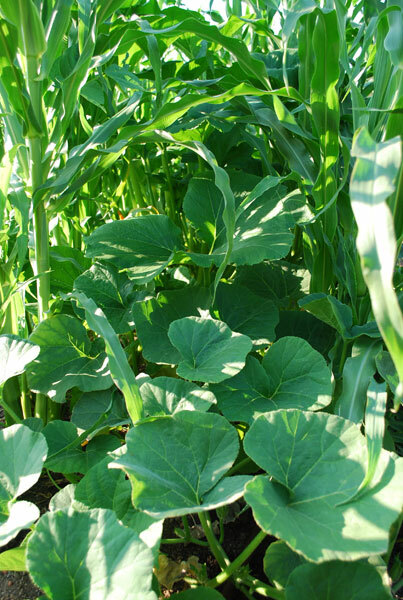 This helps hold in soil moisture, and the spiky leaves and stems deter rodents from climbing up to eat the corn. Planting herb borders around vegetable beds or planting herbs in among your vegetables is another vegetable garden planting strategy for companion plants. 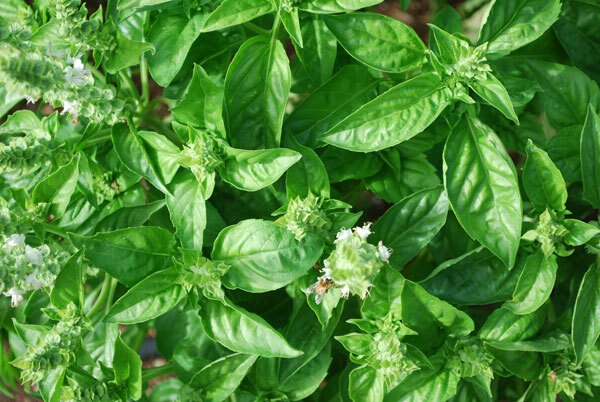 The aromatic foliage of the herbs “jams the radar” of garden pests seeking hosts. Root exudates from the herbs also enhance the flavors of certain vegetables if they’re planted together. Two classic examples are pairing tomatoes with basil, and summer savory with green beans—and is it only a coincidence that both work so well together in the kitchen, as well? Vegetable Crop Rotation is the practice of rotating crops to avoid planting the same vegetables in the same place every year. When vegetables—or vegetables from the same plant family—are planted in the same place year after year, they gradually strip the soil of the nutrients needed by that crop, and pests and diseases build up in the soil. Most vegetable crop rotations are based on distinguishing between heavy feeders, light feeders, and legumes. Summer vegetables like tomatoes, potatoes, eggplants, peppers, chiles, squash, pumpkins, cucumbers, melons, and corn. Stalk vegetables like celery, fennel, rhubarb, and artichokes. Green, leafy vegetables like lettuce, spinach, Swiss chard. Cruciferous vegetables like broccoli, cauliflower, cabbage, Brussels sprouts, kale, collards, and Asian greens. Light Feeders are mainly root vegetables like beets, carrots, and parsnips. Light feeders need little or no fertilizer in good garden soil, and only light fertilizer in sandy soils. Root vegetables given too much nitrogren produce luxurious top growth that attracts insect pests, and small, misshapen or forked roots. Legumes like beans and peas form symbiotic associations with rhizobia bacteria on their roots. The bacteria fix atmospheric nitrogen for the plants, while the plants supply the bacteria with sugars, starches, and amino acids to fuel their growth. Legumes are used to recharge and revitalize the soil. Avoid planting members of the same vegetable crop family in the same place every year. For information on which vegetables are in each vegetable crop family, see How to Grow Vegetables. Follow a heavy feeder with a light feeder, and a light feeder with a legume to restore soil fertility before planting a heavy feeder again. This basic rotation schedule reduces soil depletion and the buildup of pests and diseases.